Wright Manufacturing 36" Sport I mower has been awarded a Twenty for 2017 new product award. Wright Manufacturing's 36" Sport I wins twenty for 2017 award. Wright Manufacturing has won a Twenty for 2017 new product award for its Sport Intensity lawn mower. The 36” Sport I, as it is known, was introduced last fall, at GIE+EXPO, the largest landscape products trade show in the country. The Sport I is a new twist on the popular Stander® stand-on mower that Wright invented in 1997. The compact mower’s size and maneuverability make the Sport I ideal for consumer, as well as commercial, use. It combines all the features that make the Stander the industry’s leading stand-on mower with the choice of stand-on or sit down operation. 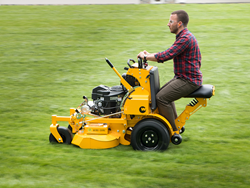 The Sport I’s fold-away seat is positioned so the operator can step off for quick exits or to remove debris, and the mower stops immediately. An operator presence switch on the foot platform stops the blade and engine, and the control levers return to the neutral position when the operator lets go. All Sport I mowers are equipped with Wright’s AERO-CORE™ deck. This floating deck tilts side-to-side and front-to-back, allowing the mower deck to better follow the terrain contours. It also improves the weight distribution for better handling on hills. The deck height can be adjusted “on the fly” in quarter-inch increments, and anti-scalp rollers automatically adjust the deck height to changes in terrain. Recessed caster wheels reduce the turning radius. This feature, combined with the compact footprint and outstanding control and handling, allows operators to trim as they mow. The Twenty for 2017 recognizes the top 20 new products in the commercial landscape and irrigation markets. The Green Media editorial staff selected the winning entries based on innovation, marketability and application within the market. Green Media, a division of EPG Media and Specialty Information, Minneapolis, Minnesota publishes Landscape & Irrigation magazine. The Sport I can be test driven at any Wright dealer. To find a dealer, visit wrightmfg.com or phone 301.360.9810. Wright’s offices and manufacturing facility are located in Frederick, Maryland.